Filmmaker John Ford projected a nostalgic, romantic notion of 19th century stage travel through his movies, using only a few passengers and the very photogenic, heavy Concord coach as his star. In the West of more than 100 years ago, lightweight celerity wagons, mud wagons, Dougherty spring wagons, and ambulances ruled the roads. (1) These were pulled not by sleek horses, but more often than not by mules through the deserts and mountains. While Utah’s picturesque Monument Valley offered wonderful backdrops for Ford’s films, early overland stages traveled through the deserts of western Texas, southern Arizona, and southern California. The actual experience on board a stage was nothing like it was depicted in the movies. A “through” passenger was one going all the way, from the beginning of the line to the end; a “way” passenger traveled only part of the distance. The U.S. mail contract with John Butterfield called for the journey to be made in 25 days, but it usually took about 22 days. Unfortunately for passengers, the U.S. mail was given first priority by cross-continent stage companies. The driver and conductor or guard sat on the open bench in front. On some vehicles, luggage and extra passengers traveled on the roof. Mail was stowed in the boot at the back or at times beneath the driver’s seat. Coaches had a lurching, rolling motion that was increased by rough roads. 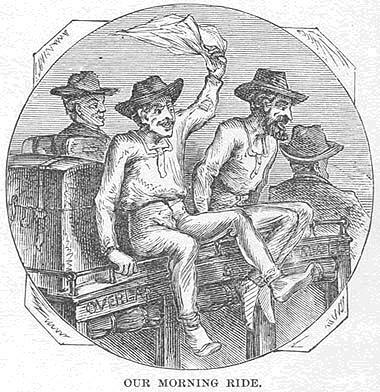 Some travelers suffered from motion sickness—similar to “seasickness” but without any refreshing sea breezes. William Reed described the experience. A through-ticket and fifteen inches of seat, with a fat man on one side, a poor widow on the other, a baby in your lap, a bandbox over your head, and three or more persons immediately in front, leaning against your knees, making the picture, as well as your sleeping place for the trip. Passengers push a stage in the California gold fields. From Alonzo Delano's Pen Knife Sketches, 1853. If passengers chose to stay in a town or at a home station to seek relief from their journey, they could become stranded for a week or more before resuming their travels. A ticket did not guarantee passengers the right to travel on the next stage, when the seat was occupied by another. (1) Ambulances, used during and after the Civil War, and the Dougherty spring wagons were lightly constructed vehicles, open to the sides and to the front, with the driver seated beneath a canvas awning, with a footboard on the front of the wagon bed. Nick Eggenhofer, Wagons, Mules and Men: How the Frontier Moved West, Hastings House Publishers, New York, 1961. P. 122. 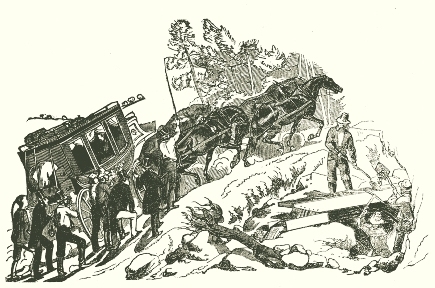 (2) William, Tallack, The California Overland Express: The Longest Stage-Ride in the World. Leisure Hour, London, 1860. Historical Society of Southern California reprint, Los Angeles, Ca., 1935. (3) William Reed, “From San Diego to Tucson: A Glimpse of State Stations, People, Trails & Transportation,” Brand Book, The San Diego Corral of the Westerners, Ray Brandes, ed., 1968. P. 129. (6) W. Eugene Hollow, “Great Days of the Overland Stage,” American Heritage Magazine, Vol. 8, Issue 4. June 1957. (7) Reed, Ibid. P. 130. (8) Reed, Ibid. Pp. 134-135. (10) Waterman L. Ormsby, The Butterfield Overland Mail, Lyle H. Wright and Josephine M. Bynum, eds., The Huntington Library, San Marino, Ca., 1942, Reprint 1998. P. 73.